Who else is "Pumped Up For Pumpkin?" It's mid-October and the pumpkin craze seems to be in full force. It's hard not to jump on the bandwagon when stores are showcasing it everywhere. Me, I'm a pumpkin puree, create my own recipe, kind of girl which is exactly what I did when I got several cans of pumpkin to work with from Sprouts Farmer's Market. 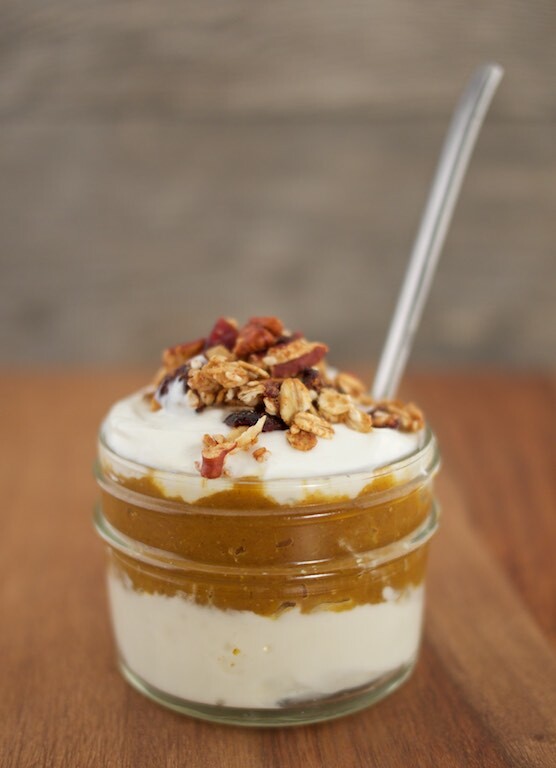 These Pumpkin Parfaits are filled with good for you pumpkin puree and Greek yogurt. They are perfect for breakfast and also make a healthy afternoon snack. Fulfill your pumpkin craving with this easy to make treat. Mix pumpkin puree and next 6 ingredients together. Layer small cups with Greek yogurt and pumpkin puree mixture, alternating. Top with homemade granola. I have an ongoing relationship with Sprouts.. I receive product, coupons or compensation for posts featuring their products. As always, all opinions are 100% my own. These look delicious and I love the mini mason jar! Sounds yummy and a great way to combine some very healthy ingredients! I'm normally get sick of pumpkin at some point but I'm still going strong! These look amazing! This looks amazing, I usually make a pumpkin parfait at Thanksgiving - loving the healthiness of your recipe! Great idea, love the Greek yogurt-pumpkin combo! Looks really delicious and such a great wholesome treat! These are the perfect size parfaits! I would eat this for breakfast and a snack! That is the cutest size jar! And yes, pumpkin is everywhere - my favorite part of October! Is it wrong that I want a bowl for breakfast? :)Great pumpkin idea! This looks delicious! I love all things pumpkin. Oh I think I will do this for my girls on Halloween! They will love it! Thank you! What?? How have I never thought of this? Thanks! Oh... perfect. I'll make it with coconut yogurt! These look delicious. I would need to do dairy free yogurt but other than that.. YUM! A lot of people are going to love this! I love all things pumpkin, these parfaits looks wonderful, perfect for a fall breakfast or brunch! I'm always in the pumpkin mood. Love the look of these cute little parfaits. Wow, Pumpkin parfaits! These look very delicious. I can't wait to try this recipe. They look very delicious. Oh my, this looks amazing and I love that little jar! So cute! Thanks for sharing at the #HomeMattersParty - hope to see you again this weekend.